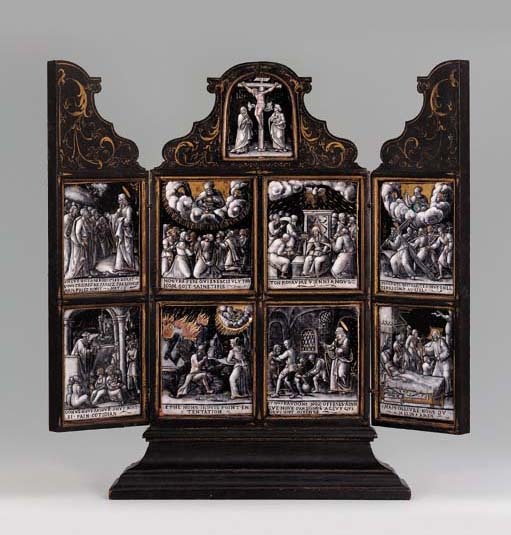 Consisting of nine enamel plaques set in a later parcel-gilt wood surround; an arched panel above depicting the crucifixion and eight rectangular plaques each inscribed with a line from the Lord's prayer; the reverse with an old label 'St. George's Exhibition/Duke of/Norfolk/1886' and the underside with an old catalogue entry. When Marquet de Vasselot wrote his article on the series of enamels executed by Couly Nouailher on the theme of the Lord's Prayer (op. cit. ), he stated that there was only one known complete set of eight, in the Chabrières-Arlès collection. Fragmentary sets were to be found in a number of other collections, including the Fitzwilliam Museum. A closely comparable set - attributed to Pierre III Pénicaud - has since been discussed in Verdier (loc. cit.). Marquet de Vasselot noted that the enamels appeared to be based - sometimes rather loosely - upon engravings executed by a Basle monogrammist known by the initials 'C.V.' (op. cit., pp. 224-225). An incomplete set of engravings in the Cabinet des Estampes in Paris, also with the initials 'C.V. ', display inscriptions in French such as those evident on the present enamels. The painting style here is not consistent with an attribution to Nouailher but is closer to the treatment of Pierre Reymond, one of the most prolific enamellers of 16th century Limoges. The present lot, which was formerly part of the Duke of Norfolk's collection, was included as part of the historic three day Norfolk House sale, held on the premises in St. James's Square in 1938.